Rebecca Hollweg is a singer and songwriter. She lives in South London with bass player Andy Hamill and their daughter Ruby. In February 2015 she released a third album of 10 new songs, called ‘Country Girl’, produced by her husband Andy Hamill and featuring her band of leading UK musicians. 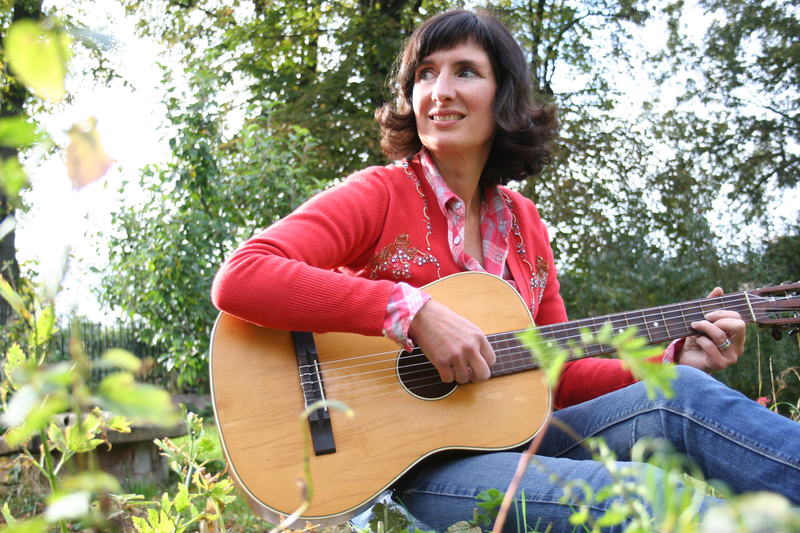 Rebecca is the daughter of visual artists Alexander Hollweg and Geraldine Hollweg and grew up first in West London and then in very rural West Somerset where she started writing songs at a tender age. She is the sister of food-writer and cook Lucas Hollweg. In October 2001 she released her first album ‘June Babies’ on Emu Records – 12 tracks of melodic pop songs, featuring string arrangements by Chris Bowden and a guest appearance by singer songwriter Jeb Loy Nichols. Produced by bass player Andy Hamill (whose credits include Laura Mvula, Rumer, 4 Hero, Mark Murphy, Carleen Anderson, Jeb Loy Nichols, Nitin Sawhney and Kylie Minogue amongst others), it received critical acclaim in the national and music press (see home page) and went on to get played on the Jeremy Vine Show on BBC Radio 2 show. In 2002 Rebecca featured on Andy Hamill‘s own album ‘ Bee for Bass’ (also on Emu Records) in a duet with Jeb Loy Nichols. On the same album Carleen Anderson recorded Rebecca’s lyrics to ‘Falling’, commissioned by its composer New York double bass legend Harvie S.
In the same year she did her own headline tour of the UK, appearing on BBC Radio 4’s Woman’s Hour with Jenni Murray and doing sessions for Janice Long on BBC Radio 2 (in the old Pebble Mill studio in Birmingham) and Tom Robinson on BBC Radio 6Music. Later in the year she supported Roger McGuinn of The Byrds on his UK tour, playing major theatres and concert halls round the country. In 2003 she got married to Andy Hamill! In November of 2003 she supported Paul Carrack (formerly of Squeeze and Mike & The Mechanics) on his UK tour, again playing major venues – henceforth known as ‘brown sign’ venues, because you don’t need a map to find them. The title track of ‘June Babies’ got used by the BBC in a programme about women runners! All this time Rebecca continued to play London venues including The South Bank Centre, Ronnie Scott’s, The Borderline and the 606 Club, as well as arts centres and venues round the UK. In 2004 she produced a daughter, Ruby, already a great singer and all-round musician. Rebecca continued to do gigs, mostly in London, and continued work on a new album which she had begun recording before her daughter was born. January 2008 saw the completion of that album, ‘Orange Roses’ – 9 tracks of mellow, melodic songs with a country tinge. Again produced by Andy Hamill, the album features the same great musicians as ‘June Babies’ – Andy Hamill (bass), Mike Outram (guitar), Phil Peskett (piano), Tom Gordon (drums) and also Julian Ferraretto (violin, viola and string arrangements). Singer-songwriter and artist Jeb Loy Nichols designed the cover. The album again received good reviews and was played on BBC Radio 2 by Janice Long, Eamon Holmes, Alex Lester and Aled Jones. Rebecca did a second Radio 2 session for Janice Long. 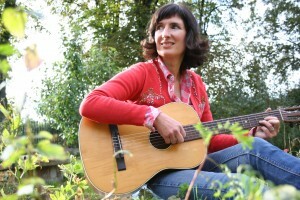 In 2009 Rebecca played her first gigs and festivals outside the UK, at Rochfort en Accords Festival in France, Vamos Festival in Crete (organised by songwriter and former member of The Korgis Phil Harrison – a big early influence) – 5 and 55 Festival, Wijk an See in Holland, plus other gigs in France and Germany. Her song ‘Orange Roses’ was highlighted by Aled Jones on his BBC Radio 2 programme to tie in with Dementia Awareness Week. She also played at Belladrum Festival in Scotland. In 2010 she played 3 nights at Lattitude Festival in the UK, and was invited back to play at Vamos Festival, Crete, sharing the bill with 2 former members of the Korgis, Stuart Gordon and Phil Harrison – both formative influences on Rebecca’s music-making. Her song ‘Orange Roses’ was highlighted for the second year running and in more detail by Aled Jones on BBC Radio 2 and received an overwhelming response from listeners, several of whom played it at family memorial services and said they felt it could have been written for them. In July 2010 she published a children’s story called ‘The ball that got stuck in the tree‘ with illustrations by singer-songwriter colleague and print-maker Jeb Loy Nichols. In July 2011 she continued to play gigs in London and was invited back to Crete to play at Vamos Arts Week for a third time, this time sharing the bill with poet Roger McGough. She played Moseley Folk Festival in Birmingham at the recommendation of BBC Radio 2 DJ Janice Long, who introduced her set. During 2012 she became a regular guest of poet and comedian John Hegley, at his monthly London night and also at Keat’s House while he was poet in residence there. She played Aldeburgh Festival Fringe, and other gigs round the UK, and played at Latitude Festival for the second time. In 2013 and 2014 she played more gigs in London, including Pizza Express Dean St, the South Bank Centre and the 606 Club. She appeared regularly as the guest of poet John Hegley, and did a session for the Simon Lederman Show on BBC Radio London. She also sang on several tracks for the new album from Tony Penultimate, aka Peter Brooke Turner of The Ukulele Orchestra of Great Britain. In February 2015 she released a third album of 10 new songs, called ‘Country Girl’, produced by her husband Andy Hamill and featuring her band of excellent musicians. Tracks from the album have been played on BBC Radio 2 by long-time supporters Jamie Cullum and Janice Long. She played the new songs live on The Robert Elms Show on BBC London, on World Update with Dan Damon on the BBC World Service, and on Johnny Coppin‘s Acoustic Show for BBC Gloucester. She also recorded 3 songs live for The Ayala Show for Irish TV. Later in the year she returned to play at Kalamitsi Arts Festival in Crete, and headlined at Rockhampton Folk Festival in Gloucestershire. She continued to play regular London venues including the legendary 606 Club. At the lovely Green Note, she played a double bill with Nashville artist Mean Mary and has gone on to play other gigs with her. In early 2016 she played some dates in Melbourne and Adelaide, AUSTRALIA with Andy Hamill and Julian Ferraretto. In Summer 2016 Rebecca played her first gig at Glastonbury Festival on the Croissant Neuf stage in The Green Fields, and also played at Art in Action Festival in Oxfordshire, followed by a concert in South West France. She played her first gig in Paris at L’Angora in November, which followed as a result of her appearance at Rochefort en Accords International Festival in 2009. In Summer 2017 she made a small tour of South West France and is invited back next year. She enjoyed speaking French in between the songs! In 2018 Rebecca is returning to play more gigs in Crete, and to Rockhampton Folk Festival and playing more gigs in the UK and Europe with Nashville-based singer-songwriter and banjo player Mean Mary and long-time colleague and friend Jeb Loy Nichols. Rebecca’s live gigs these days frequently include great vibes-player, percussionist and drummer Justin Woodward. Rebecca sang on Simon Higdon’s debut album ‘A Contribution to the Arts’, and is beginning a harmony-singing collaboration with childhood friend and musician Anna Tanvir. Rebecca is currently finishing an album of covers – favourite standards and classic pop and singer-songwriter songs she has always sung. Produced by Andy Hamill, this will be released as downloads later in the year.